Horde players must first complete Cala Cruzpot's quest chain before this pet will appear on the vendor. @Meheandtheeis3, everything you did is just fine, but it will not change the fact of updates to the website. It's a matter of time. It can take 24 hours of wait time to reflect a change of just 1 battle pet leveling from 1 to 25. Other than that, Lil' Benfon is super cute. He's a basic beast vs critter. He's a tiny dinasaur that you just want to pet. 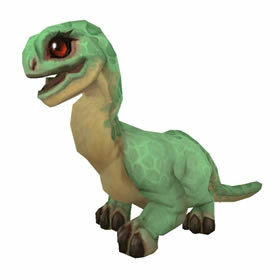 PET COLLECTORS RE: Lil' Ben' Fon For those of you who want to collect the Horde only pet. Go back to (57, 32) where Happy Holaua is located . I Logged out for the night Did not get the mail telling me it was there. Check he's in the shop. Log out, mail 300 charms to your boost. Buy him. Makes 2 or 3 different growl noises when clicked on. I can only really tell the difference between 2 of them though. Will also randomly make the noise on its own while idle. White Brutosaurs were on the brink of extinction until some enterprising adventurers took action. Lil' Benfon may have inherited her father's size, but definitely has her mother's temper!